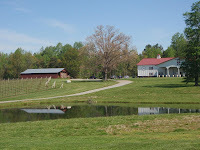 During our drive down to Merlefest we visited our first Yadkin Valley winery: Laurel Gray Vineyards. The Yadkin Valley is situated between the Blue Ridge and Brushy Mountains and is slowly becoming an important wine producing area on the east coast. There are over 25 wineries in the valley with some being old tobacco farms converted to vineyards. This practice is not as common as we thought since most tobacco farmers who received settlement money, simply retired - why even think about the strenuous labor associated with growing grapes. 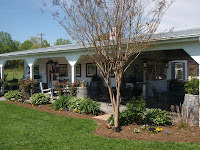 However, one such converted tobacco farm was Laurel Gray Vineyards. 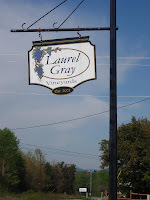 We selected Laurel Gray Vineyards simply because it was the closest to route 421. We learned that it resides in a new sub-appellation - Swan Creek Appellation along with five other wineries. The winery is owned and operated by Benny and Kim Myers, who first planted the vineyards in 2001 on the former dairy and tobacco farm. Interestingly Myers can trace his ancestors to when they arrived in the valley in 1773. That's 10 generations. The next generation also helps with the winery, and is who the winery is named after, Ashley Laurel and Taylor Gray. In fact Ashley is the resident grape expert having earned a M.S. in Plant Pathology and by working in Virginia as a Grape Pathology Extension Specialist. Kim Myer met us in the tasting room and we learned that Laurel Gray specialized in French styled wines. To date the region does not have a clear specialty since the industry is so new. Some wineries specialize in Italian varieties, whereas the Myers believe that French varieties have the most potential - particularly Chardonnay. Their Chardonnay is fermented and aged in French oak for 12 months which provides a soft creamy texture. The wine possessed the nice chardonnay flavor with a slightly vanilla finish. We preferred their Viognier more since it was made in a more acidic style - plus it had a nice apricot flavor. The winery makes several different red styles from dry and full bodied to a semi-dry summer red. We started with the Sultry a blend of Syrah and Cabernet Sauvignon. The wine is aged in three different types of oak which helps produce a slightly spicy finish. I guess the Syrah would have a hand in that as well. Their Cabernet Sauvignon is produced in the same fashion, just aged slightly longer to 18 months. We liked this more than the Sultry - it was more full bodied and just seemed to have more jolt. They also produce an Estate Cabernet Sauvignon, which not surprisingly, we liked the most. The nose contained aromas of figs, the middle full bodied, while the tail was slightly tannic. A nice wine, except for the price tag. Is it worth $29? The final red wine was one of their top sellers, the Scarlet Mountain, made from traditional Bordeaux varieties. However, that's where the similarity ends. Some Chardonnay is added to the blend making this wine a little off dry - designed for summer days. We liked it and it contains the strong cherry flavors that were advertised. The final two wines were sweet wines, starting with the Rose’ 1773, a blend of Chardonnay, Viognier and Syrah. It isn't really as sweet as advertised and has a nice strawberry flavor - the wine that compliments spicy foods. The final wine is made from 100% Niagara, the grape we came to like while visiting wineries when our son was an infant. He always wanted us to drink the same fruit that was in his white grape juice. In any case, the Nectar is really good - if you are like us and enjoy the fruity aroma and flavor of the grape. And it is not as concentrated as most dessert wines. Others were purchasing it rather quickly during our visit. This was a nice spot to break our drive to Wilkesboro. We can see why the winery receives frequent visitors from Charlotte - its a nice location to hang out during the day. And since all the wines are sold strictly from the tasting room; that's the only method people have to purchase these wines. See you again before next year's Merlefest. On Thursday April 23 we were invited to a Burgundy Wine Tasting held at the French Embassy and hosted by the Burgundy Wine Board (BIVB). As expected, the expo provided fabulous Pinot Noir and Chardonnay wines as well as a nice overview of the Burgundy region. Wine has been produced in this region for over 2,000 years, which is remarkable since many the the ancient wine growing regions are no longer producing wine. We also learned about the five vignobles within Burgundy, from Chablis in the north, through Côte de Nuits to Côte de Beaune and finally to Côte Chalonnaise and Mâconnais in the south. We started with the Pinot Noirs and we found a common trait among most of these wines in that the nose was peppery, but on the palate the wine was full cherry flavors with little or no spiciness. Not even a lot of earthiness. Maybe the winemakers are succumbing to the American palate. With over 30 exhibitors we didn't taste wine from every company or even the entire portfolio within an exhibit; with that said, of the wines we tasted, we found some keepers starting the 2005 Clos des Langres Monopole from Domaine d'Ardhuy. Evidently 2005 was an excellent vintage in Burgundy, and this wine reflects that. It is smooth and creamy even with the aforementioned peppery nose. But the tail, no tannins - completely smooth. Located in the Côte de Beaune this winery also produces an excellent Grand Cru from Chardonnay and Pinot Noir. Beaune was also the region that produced our other two favorites, the Domaine Chanson Pere & Fils, 2005 Clos des Feves and the creamy Bourgogne Parent, 2002 Les Epenottes. There were other outstanding reds. Starting with Maison Louis Latour, Clavelier & Fils, Domaine Tortochot, and Chateau de Melin. In many cases the actual winemaker was pouring the wines so we were able to meet the families and learn about their history. Many of these wineries have been in the same family for over 5 or 6 generations. One overlooked benefit is that their is an immediate library of facts and history that the winemaker can resource when weather conditions make winemaking difficult. In most situations, there is a documented history to suggest alterations duing the winemaking and evidence how the wine matures in these years. This is difinately somthing missing in the states. Because of time constraints, we did not sample many chardonnay wines. The Chateau Beru was one of our favorites, producing only whites. Another winery that just produced chardonnay was Cave de Vire. And we can't forget the Closerie des Alisiers - Stephane Brocard. We started with their red Gevrey-Chambertin, but really liked their chardonnay - particularly the 2007 Meursault. Another benefit of this expo was the booklet of reading material we were able to take home. We will be studying this region, learning more bout its history, regions, wines, and wine-making families. More photos are available at the Compass Tours section. Our friends at the Virginia Food and Wine Foundation have just announced the dates for the first annual DC's Wine Country - Food and Wine Festival. This festival will occur during the evenings of July 10-12, 2009 at the historic Whitehall Manor in Bluemont, Virginia and will highlight the fabulous wines being produced by twenty wineries in Loudoun County. Besides the $30 general admission, there are a few dining packages available. All proceeds will benefit the Virginia Food & Wine Foundation general scholarship fund which supports culinary arts and wine studies. Attendance is limited so we recommend ordering early. While spending time in south Florida, we haven't drunken much wine, and as for beer, PBR and Schlitz seem to be the most satisfying while under the sun. But what we can't restock quickly enough is Leblon Cachaça. We had received a sample a few months ago and never opened under now. What a waste. This Cachaça is fine on the rocks and a perfect in a Caipirinha. Move over Mohitos. According to their website, "Leblon, is distilled at a state-of-the-art distillery, Maison Leblon, in the fertile Minas Gerais region. Gilles Merlet, the master distiller, approaches the fermentation, distillation, and finishing of Cachaça like a fine wine. Using techniques from his native land of France, Gilles manages every detail of the creation - from the hand-selection of the cane and his proprietary fermentation approach, to the Alambique batch-distillation and light-casking, triple-filtering, and master-blending. Gilles rests the final distillate in XO Cognac casks from France, giving Leblon an extra-special touch. As a result, Leblon Cachaça has a delicate, fruity nose, combined with an ultra smooth finish." We have tasted several excellent cachaças over the past two years and Leblon is easily the best. Don't trust our opinion? For the past 4 years, Leblon has been awarded gold medals at the 2009 San Francisco World Spirits Competition; a first for any cachaça. Now that's quality. If there’s one thing that can bring a group of close friends or family together, it would be done with a bottle of wine. Seeing as how giving the gift of wine is such a popular choice around the holidays, for housewarming parties, or for casual dinners throughout the week, the idea of creating your own wine cellar with your existing collection of wine is always a great idea. Not only will you be able to properly store your bottles on a set of sturdy wine racks so that they may age over time but it will also allow you to be prepared for a last minute event at your home. It’s important to keep in mind the temperature, amount of light, and humidity of the room you choose. Many people choose to use their basement to store their wine collection as this is one of the darkest, coolest areas of their home where dehumidifiers can be stored as well. The humidity of a wine cellar should be stay around 65-70% so as not to let the corks from drying out or cracking and this will also allow them to stay airtight in the wine bottle. Your wine cellar should stay at a constant temperature between 45-65°F and the optimal temperature for maturing wine is anywhere from 50-55°F. Wine should be in the darkest space you can find as natural light can potentially ruin the aging process and taste of the wine when you finally decide to use it. When choosing the perfect wine rack for your collection, find a reliable model that allows the bottles to lie flat on their sides so as to keep the cork moist. Place more expensive aged wines in the back rows of the racks so as to keep them out of the way for special occasions in the future as this will provide a space for wine you plan on using soon in the front for easy access. If you don’t have a cool, dark space in the home for wine storage, you can always look into purchasing a wine cabinet that will provide proper temperature and light conditions for you. 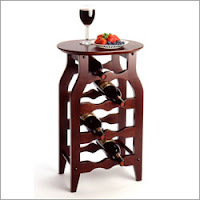 This option allows you to hold anywhere from five to a few hundred bottles of wine and can be used as a decorative piece of furniture in your formal dining room or bar area.